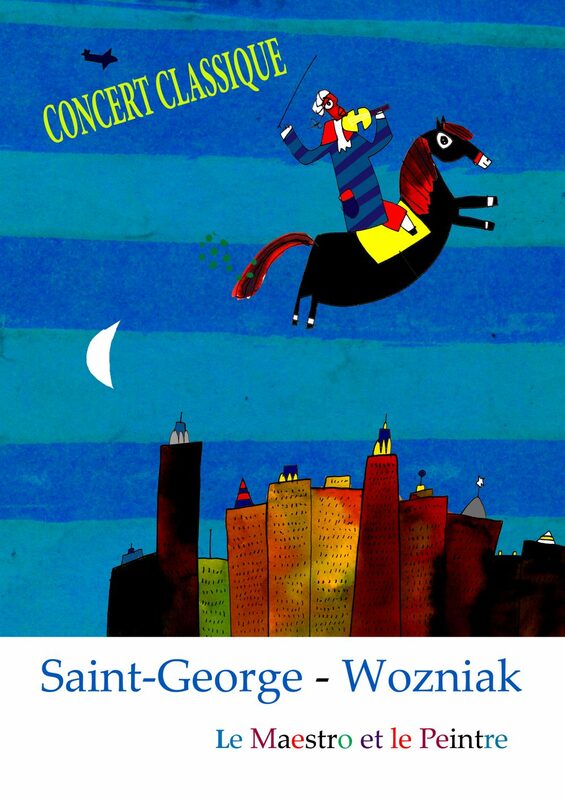 Break down barriers between different artistic expressions to melt them in one setting: this is the concept of the new concert / show and which is proposed by the association « the Concert of Monsieur de Saint-George » in close collaboration with Wozniak. The show, scheduled for 2016, will feature animated images of the painter on a music served by a chamber orchestra enriched with a solo violinist, a harpsichordist and a soprano who will perform the works of St. George. Projections of paintings, characters that haunt his portrait gallery, videos and improvisations will evolve on the music of « the chevalier ». Wozniak is one of the first artists to have had a passion for the rediscovery work of the « Black Mozart », conducted since the creation of the association in 1999. Drawings for the website and paintings for CD covers have succeeded to value the great works of this son of a slave and a French gentleman. In the early 2000s, when he created this beautiful idea of pictures and music » with the inventor of free jazz, Archie Shepp, Wozniak, for the first time, mentioned to us his idea to mix the two most popular artistic expressions. Fifteen years later, he followed up the performances with the great saxophonist, and with the jazz drummer Ramon Lopez, and singer Manu Chao. The idea of working on his pictures with classical music as support and to animate them on that of St. George music, dense and emblematic composer, was evident. First, the two palettes, one of the composer and one of the painter match perfectly. The music of the Caribbean virtuoso climbs from bass to treble at a disheveled rate, alternating extreme contrasts between melancholy and joy. The painting of the artist of Polish origin, a political exile, explodes in flamboyant colors, like those of Chagall and his characters sometimes express unbridled joy, sometimes a profound melancholy. Wozniak painted southern peoples pain. It also carries with it their hopes, and their enthusiasm. It is also the historical meaning of this show: to show how St. George is a man of today, he, who suffered racist prejudice, rebelled against the abomination of slavery and fought, sword in hand, for freedom. St. George, today symbolizes the children who suffer, women mutilated, tears flowing. These are the vessels that are damaged in the oceans of water and indifference. His music, which always ends with odes to joy is also a song of hope. Like Wozniaks painting. You are interested in booking The Maestro and the Painter ? Please contact us.